Throughout the year, hikers and a few hardy mountain bikers toil up Barr Trail, covering 12.6 miles and 7,000 feet in elevation to the summit of Pikes Peak. Most are drawn by the trail's scenery. It meanders through exposed yucca-studded hillside, thick forests and wildflower-frosted meadows and emerges on the wind-scoured tundra. But it's that fortuitous mileage that makes it more than a trail and draws a different crowd altogether. Once a year in August, Barr Trail is a marathon race course. And it's one of the most unlikely race courses in the country, perhaps in the world. Some competitors run the entire route, up and down. Most walk at least part of the way. Some never make it to the summit. But they all realize it isn't just any old marathon. They know it's a race and a mountain to reckon with. To tackle it, runners must rely not only on their physical abilities, but their mental strength. "The Pikes Peak Marathon is always throwing something at you. It' s like a chess match for runners," says Matt Carpenter, who holds the course records for the marathon and ascent (set the same day in 1993). "In most races, nothing changes. On Barr Trail, there's the weather and the altitude, flat sections, switchbacks, water bars and on and on. You can never float. You have to always be thinking, thinking ahead." Started in 1956 as a unique challenge pitting smokers against nonsmokers, the Pikes Peak Marathon and Ascent have grown into world-famous events that attract thousands, including some of running's elite like Carpenter. This year, the races are Aug. 15 and 16. The ascent, run the first day, attracts about 1,800 runners; the marathon on the second day draws about 800. Each year, a few runners (some call them elite, others call them crazy) tackle both. Although the marathon is regulation length, 26.21 miles (the additional miles to round out the race are added on the streets of Manitou), runner Larry Miller reminds folks "it's not even close to running a mar athon. It's tough. It has the highest vertical climb of any marathon anywhere." Miller, 48, has run the ascent four times and the marathon once (his best ascent time is 2:38). The runners who attempt the mountain are attracted by the challenge, but all admit there is something more. Pikes Peak, says runner Gary Hellenga, "offers something special. I like being out in nature, and away from asphalt. You can get up and get some great views while you're running." Hellenga, 37, an avid mountaineer who started trail running when he worked in Yellowstone National Park, has twice run the ascent. This year, he will tackle the marathon. Some runners talk about tunnel vision, about losing their sense of place during a marathon. But Cindy O'Neill, 36, says she never forgets she's running in wilderness. "I don't feel the pain, or worry about the trail, roots and things. I'm just looking ahead and thinking about my running." O'Neill is running the ascent for the sixth time. She typically finishes in the top five; last year, she came in third, and in 1995 she was second, with a time of 2:54. Runner Laura Engleman, 44, of Woodland Park, notes the differences between running on pavement and running on Pikes Peak's dirt and gravel. "Trail running is easier on the body - there's not all that relentless pounding," she says. "There's more joy in trail running. And Pikes Peak is the ultimate trail run." Engleman, who will run the ascent and marathon this year (last year, she was one of fewer than 50 runners who ran both, and her times were 3:55:55 and 7:21:58, respectively), is hooked on the mental and physical challenge Pikes Peak presents. "It's like a big puzzle. Did I start too fast? Too slow? Did I eat the right things before? Did I train on hills enough? Did I drink enough water?" Knowing how to prepare for this race is crucial, say runners. Experience in running at high altitude, in pushing the body at a place that has half the oxygen of sea level atmosphere, is impo rtant. And knowing the vagaries of the weather can make or break a runner. "The change in altitude is a big thing - wondering whether you are able to deal with less oxygen when you hit 12,000 feet," Hellenga says. Miller believes that runners should prepare their bodies, and that the best way is to work out at altitudes above 12,000 feet. "You need to know how your body functions at high altitude," says Miller. "Some people, like Matt (Carpenter), thrive there. For others, it takes a little longer." Hellenga trains by varying his workouts each week, sometimes throwing in speed work or a run with steep inclines. He's looking forward to running downhill, the part of the Pikes Peak Marathon that does in many runners with its average 11 percent grade. "I always enjoyed (running down mountains). There's a bit of an element of danger in it. As a mountaineer, I've done a lot of talus running - jumping from boulder to boulder. It's exciting." In the past, O'Neill has been beaten down by the altitude, but she thinks her training regime this year will help. "Before, I've always trained as if it were a flat marathon. This year, I've been training with Matt's (Carpenter's) group and we do a lot of work on the upper parts of Barr Trail. I feel better at high altitude now." The grueling requirements of running a marathon are no big deal to Engleman, who gets up every day at 3:45 a.m. and runs five miles, lifts weights, does a few sit-ups and push-ups, makes lunches for her two children, throws in a load of laundry, reads the paper, transports her kids to school and friends' houses and other activities, and is at work in Colorado Springs at 8. On weekends, she trains on Barr Trail, sometimes with Carpenter's group, and works with a fellow runner on high-altitude trails near Leadville. "I run a marathon every day," she laughs. Joe Spalding, 31, who is embarking on his third ascent this year, varies his workouts. "I do a lot of strength and endurance training, with some long runs," he says. Most Pikes Peak runners will run a race or two after this race, and then take a couple weeks off in the winter. But come January, they start pounding the trail again. On race day, Spalding says, "I try to be properly hydrated and take my time. It's a weird race because you can be in good condition and run a bad race anyway. Sometimes the mountain just wins." Two years ago, Spalding got sick and dropped from 20th place to 150th. Last year, he says cheerfully, "I threw up and still got 20th." His time was 2:57. "You never know what's going to happen," he says. "That's the appeal of the race." The dynamics also shift according to a runner's position in the field, he says. "It's a completely different race, depending on where you are. Nearer the middle and the back, there are runners who are just trying to see if they can do it. Near the front are the competitors." Carpenter is one competitor who is lured back to the mountain again and again. The 34-year-old Manitou Sprin gs man holds the record for the ascent (2:01:06 set in 1993) and the marathon (3:16:39, set that same year). He's called "the King of the Mountain" by many, and his forte is running well at high altitudes. Carpenter eats, sleeps and breathes Pikes Peak. He's obsessed with Pikes Peak. He even designed a Web site (www.skyrunner.com) that allows him to share his obsession. Every Sunday morning, Carpenter runs with an informal training group on Barr Trail, and every Thursday afternoon runs with a group he has dubbed the Incline Club, training on the near-vertical grade of the former incline railroad on Mount Manitou. His prowess at altitude has earned him worldwide acclaim - in 14 sky marathons (26.2 miles on courses 14,000 feet or higher), he has won 10. He has run Barr Trail so many times and he likes being there so much, "that I almost count the days I'm not there. I feel like if I dreaded what I was doing there, I would count to give me some reason to continue." Carpenter knows every switchback, ev ery root in the path, every twist and turn and soft spot in the trail. He believes knowing what's ahead, visualizing the trail, is a key to doing well in the race. "This is a long race, and you can't go by miles. If you know your landmarks - that there are three switchbacks coming up and you've just done two - it helps." Carpenter calls his running "a passion," and although it burns in him this year, there were years when it cooled. "Training for this race is a long, arduous process. (A few years ago), I needed a break from it so I stepped back. And when I did, the passion came back." Though everyone has his or her own method for training and competing on the Peak, all share a common bond: a passion for running. A former cyclist, Spalding enjoys running for many reasons. "You don't have to deal with the equipment. You can run at night or whenever and wherever you want." Engleman has been running only since she was 40. Her first race was a marathon in Pueblo, and aft er that, she was hooked. "Before I ran, I was the classic 40-year-old who felt fat, and didn't like myself very much. Now, I feel better about myself, and I've become a classic running addict." She has completed 10 marathons, including one last month in California, and always, even on Pikes Peak, she works to better her time and her running. When O'Neill can combine the joy she feels when she's running and the mountains she loves, she's satisfied. "I love running. I feel totally happy when I'm running. I feel strong and graceful, and I don't feel that way normally. Give me that and put me on a mountain, and well ..."
The Pikes Peak Marathon and Ascent both start in Manitou Springs and hook into Barr Trail. The W's are a set of 13 switchbacks on the front of Mount Manitou; at their end, runners have completed one-fifth of the ascent. At French Creek, a steep downhill and short flat section are followed by a steep uphill. When runners reach the creek, they' re 31/2 miles from Barr Camp. Runners should reach Barr Camp at just over 50 percent of their total ascent time. After Barr Camp, there's a relentless uphill to the sign for Bottomless Pit, and to the A-Frame, with 15 switchbacks in between. Just past the A-Frame, runners come upon a sign that says "3 miles to summit." There's probably not a runner or hiker alive who hasn't cursed at the Sixteen Golden Stairs. The number refers to 16 switchbacks, not stairs, and it's the route's most aerobically taxing section. The Pikes Peak Ascent is Aug. 15; the Pikes Peak Marathon is Aug. 16. Start time for both races is 7 a.m., with a 7:30 second wave on Aug. 15. The course for both races begins at Manitou Springs City Hall on Manitou Avenue, follows that street to Ruxton Avenue, and follows Ruxton to a short dirt spur that hooks up with Barr Trail. Once on Barr Trail, runners follow it to the summit of Pikes Peak. Each year in recent history, 1,800 r unners have entered the ascent, and 800 have entered the marathon. Each year, some runners run both courses; this year, 36 signed up. The ascent, which ends at the summit, is 13.32 miles. Record time in the men's field is 2:01:06, held by Matt Carpenter (set in 1993); women's record is 2:33:31, by Lynn Bjorklund (set in 1981). The marathon (runners turn around at the summit and go back down the trail) is 26.22 miles. Record in the men's field is 3:16:39, held by Carpenter (set in 1993); women's record is 4:15:18, held by Bjorklund (set in 1981). In recent years, 12 percent to 14 percent of the runners who entered did not finish. Registration deadline was in May. 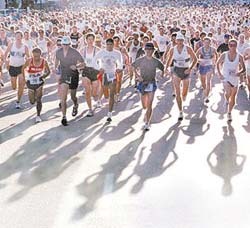 Registration for the 1999 marathon and ascent will begin Oct. 1. Forms are at the Triple Crown of Running office, 809 N. Cascade Ave., Runners Roost stores, and YMCAs in Colorado. For information, call the Triple Crown of Running, 473-2625. 1. Plan on running up- and downhill for long periods of time. 2. Spend quite a bit of time on uneven trails. 3. Don't forget that the Pikes Peak Marathon will take longer than a flatland marathon, so you should put more miles on your feet. Don't ever forget about the grade, an average of 11 percent on Barr Trail. If you run on a treadmill, set the grade to 11.5 percent or even 12 percent. If you can, work out on the mountain. There's no way to simulate some portions of the trail. And during the race, visualization is the key. If you know how many switchbacks are ahead of you at a given point, you can plan for them. Become knowledgeable about altitude. For every 1,000 f eet above 5,000 feet, you lose 3 percent of your VO2 (the ability of your body to deliver oxygen to its muscles). Choose shoes that feel good. Some runners change shoes at the top for a pair with more cushioning for the way down. Some wear shoes with a substantial tread pattern. "I wear light racing flats the whole way. I think the few gravel sections are too loose, so big treads don't help and the rest of the time just make the shoe heavier." Hydrate, hydrate and then hydrate. "My worst moment ever was in 1992, when I set the ascent record. I skipped every aid station on the way up, and paid for it in spades on the way down. I fell six times." Eat right. "I eat a little pasta and a Power Bar early that morning." Then, after the race, eat foods high in carbohydrates with a little protein thrown in, as soon as possible, instead of starting out on junk food. More tips from runners who have run the ascent and/or marathon and are training for this year's - Gary Hellenga, C indy O'Neill, Laura Engleman, Larry Miller, and Larry Threlfall. Be inventive with your training routine. In the winter, try snowshoe racing or mountaineering. If you can, train on Barr Trail. And don't always start at the bottom. Try a varied workout. Many runners drive to the top and run up and down the top mile or so of the trail. Others run from the trailhead to Barr Trail and back, or stop off at Barr Trail overnight and run from there to treeline and back. And vary the way you run on Barr. Train at a faster pace on short sections, so that you aren't stuck at a slow pace through the entire race. If you can't train on Barr Trail, train on hills. Your quadriceps will thank you. If you do train on Barr Trail or on other mountains, put in some time between 12,000 and 14,000 feet. That, say runners, is where everything changes. To get fast on uphills, train fast on uphills. Watch your posture - stay erect to provide a better push-off. Look ahead, uphill, instead of at your feet. Resist the urge to switch between hiking and running. Try baby steps, to keep your cadence. Don't over-stride and stress out your quadriceps. Once again, watch your posture. This time, lean forward. Watch your speed - cut the length of your stride and increase your cadence. Don't step up onto rocks and obstacles. Instead, step over. Stay straight. The more you move left and right, the more you increase the distance.